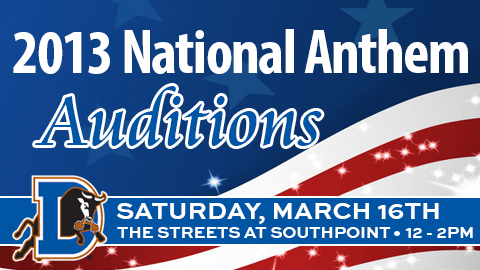 Durham, NC - The Durham Bulls will hold National Anthem auditions to find performers for the 2013 season on Saturday, March 16th from 12:00pm until 2:00pm at The Streets at Southpoint in Durham. Auditions will take place on the outdoor stage adjacent to Southpoint Cinemas and the Cheesecake Factory. Participants may register upon arrival to perform on a first come, first sing basis. Singers may leave at the completion of their audition and will be contacted later as the Bulls choose those who will perform at limited, select dates during the 2013 season. National Anthem performers will have one minute and thirty seconds to perform the Star Spangled Banner. Lyrics must be memorized and performed a cappella in a traditional style. For additional information on singing the National Anthem at the Durham Bulls Athletic Park or if you have a group interested in performing, please contact Josh Trezvant at 919.687.6545 or jtrezvant@durhambulls.com. The Durham Bulls begin the 2013 International League season on the road before returning to Durham Bulls Athletic Park on April 8th for their home opener against the Gwinnett Braves. Season tickets, 9-Game Mini Plans, and group outings are on sale now at durhambulls.com, the DBAP ticket office, or by phone at 919.956.BULL.